Approach, climb, belay, repeat until the post-climb beer - all in one jacket. 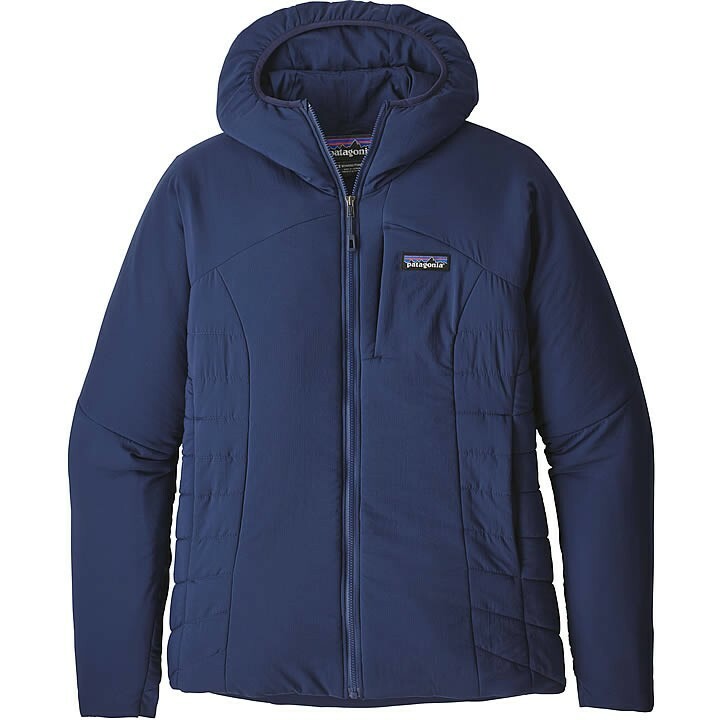 Patagonia's Nano-Air® Hoody sets a new standard for technical insulation, merging the comfort and breathability of open fleece with the protection and warmth of a puffy to keep you comfortable through a range of conditions. The supremely stretchy and breathable fabric package combines a plain-weave liner, warm-when-wet FullRange® insulation and a lightweight, weather-shedding 100% nylon ripstop shell. The hoody has an incredibly soft, supple feel and full mechanical stretch (without moisture-holding spandex) that creates a close, femininely sculpted fit over baselayers and an uninhibited range of motion. When the belay goes from chilly to downright cold, pull on a lightweight shell and the Nano-Air's thermal properties skyrocket. The trim, stretchy hood is designed for next-to-noggin use, though it'll still fit snugly over low-profile helmets. Two above-harness handwarmer pockets and a pair of smaller chest pockets all close with trim, low-bulk zippers. The center-front zipper has a zipper garage for next-to-skin comfort. A dual-adjustable drawcord hem seals in warmth, and the Variable Conditions Cuffs have sleek, low-bulk, stretch-knit insets that allow you to easily push up your sleeves. The hoody has a DWR (durable water repellent) finish.